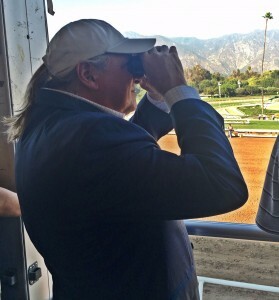 We didn’t fare too well in either the FG Oaks or the LA Derby. Most of that had to do with “situations” that arose during the race. Serengeti Empress looked to be on cruise control toward another win when she suddenly stopped and pulled up at the end of the FG Oaks. According to trainer Tom Amoss, the talented and beautiful filly bled during the race. We will catch up with Tom later today to check on her status. Just exchanged a text exchange with Tom Amoss, one of the most accessible, talented, and affable people in this business. He confirmed that Serengeti Empress bled during the Fair Grounds Oaks. Also said that no plans have been discussed for either the filly or Roiland, who ran in the LA Derby. Before those two debacles, though, we hit 5 of the first 11 races. We had a $69.90 exacta for each $1 bet in the 10th race. And, we had a nice, positive ROI on both on straight and exacta wagers for the entire day. Today is the final day of the mammoth Fair Grounds meet. Thanks to all that have helped supply updates, and assistance throughout the meet — in particular Ryan Martin and Joe Kristufek. Look forward to seeing you guys again later this year. 1st: 7-9-2/1-3-6…I’mwildaboutcarlos (7) will be moving up to the big leagues today and she will get her first start ever at the Fair Grounds. Her trainer has held his own here this meet, with a 3-3-7 resume in 22 starts this meet. This 5YO mare is coming off a fourth place finish against open company down at Delta Downs. Before that start — which was her first outing in 5 months — she won easily at Delta in October. Barn hits with .12% of those making the second start off a layup. Gets a huge rider switch for this one. Should fit nicely here. Monarchos Prayer (9) is a 5YO mare who has 2 wins and 4 seconds in 12 career starts. Romped at Delta last time out. Now, returns to FG, where she is 0-0-0 in three starts. But has been running against much, much tougher when here before. Barn hits with .41% of those trying to repeat in the claiming ranks. Wins with .23% of those that won the last race. A Toast to Gertie (2) will return to the big leagues today after a win last time out against open company at Delta Downs. Loses that condition and moves up in class, though. Barn hits with .21% of those trying to repeat in the claiming ranks. I bet the 7 to win/place/show and then box the top 3 in the exacta. 2nd:5-7/6/3-8-1…Blingonthwing (5) is a Texas-bred mare who will have to convert from the grass over to the main dirt track today, but she has been facing much better in the past. Will be making the first start for a new barn after being claimed last time out. Barn hits with .22% of those making the initial start for the new connections. Also, this one will be dropping off the claim for an outfit trying its’ best to close ground for the Trainer’s Title here. Top rider gets up. If she can handle the conversion of the surface, she will be tough here. Dancer Caller (7) ran second last time out here on March 3. Gets the same top rider to take the reins again today. In 15 starts here, has a 4-3-4 record. Should fit with these. I bet the 5 to win/place/show and then box the top 2 in on exacta. I will key the 5-7 over/under the 6 in two smaller versions. 3rd: 6-4-5/8-11/3-10-9…Peace Treaty Pat (6) is dropping from the MSW ranks, in the LA-Bred only category, and goes to $10,000 price tag today. Trainer hits with .24% when dropping from MSW to MCL ranks, and that is in 87 tries. Solid work here on March 17. Barn hits with .14% of those going from a route to a sprint. The one to beat, but will need room late to close. Don’t Tell Stacy (4) ran second at this level last time out. Barn hits with .17% of those making the third start off the layup. Mike’s Song (5) is a firsts time starter for a top barn operation. Works OK for this one, and the barn hits with .24% of those making the initial appearance in the afternoon. I bet the 6 to win/place/show and then box the top 3 numbers in the exacta. 4th: 6-3-4/2-1/8…Cube (6) should have won this level race last time out. Was beaten a nose after making the lead late. Nipped at the wire. Time before lost by less than 1 length as the favorite. Barn hits with .22% of those racing in the MCL ranks, and the trainer/jockey have combined for a 3-2-1 record over the last 8 starts together. The one to beat. Doorag Jimmy (3) is a first timer from the same barn as the top choice. Working very well of late. Should be ready for the grass debut, as the dam of this one has produced 2 turf winners from 5 starters already. On the Muscle (4) is dropping from the MSW ranks into the claimers for the first time. Barn hits with .23% of those that do that. Gets a talented rider in the saddle for this one, too. I bet the 6-4 across the board and then box the top 3 numbers in the exacta. 5th: 5-7/1-3-6/4-2…Star Guitar Stakes…This is a 11/16-mile Stakes event for the LA-breds only, and I will give the edge to Underpressure (5) — who is coming off a nice win over the main track here in the Dixie Poker Ace Stakes last time out. In 6 starts over this track, this 5YO Birdstone horse has a 2-1-2 record. Is 0-for-10 at this distance, though, and that is a real concern. Take note. Mageez (7) is 0-for-7 at this distance, too. But has a 2-7-1 record in 13 starts here. Ran second to the top choice in the last race. Still looking for an upset winner? Yes. I go to Payday Too (6). Has 2 wins in 4 tries at this distance and 2 wins here. Gets 8-1 odds. Love it. Upset Special with the 6. Gladyousawme (1), who is at 5-1 in the ML. Gets a key rider switch for this one and ran well before being caught late in the last out. Tired in the one, but went too fast on the front end. Should improve today. Grande Basin (3) has a shot, too. I bet the 6 to win/place/show and then key the 6 over/under all the numbers listed above. 7th: 10-(13)-9/3-2-(16)/6-11-8…Rickey Dale (10) looks the best on paper here. This 3YO gelding is coming off a nice second as the beaten favorite. Barn hits with .35% of those coming back the next time. Gets a huge rider switch for this one. Won here in December, as well. Will push the pace with a clean break. The one to beat may be on the AE List — Holy Sunrise (13). This one comes from a standout barn operation, which has won with .32% of the 81 starters here this meet. Gets a top rider assigned. Look at the race here two back. Should have won that one. Could be tough if draws in. Juneberris Sound (9) has a 1-1-1 record in 4 starts here. Gets a nice drop in class for this one and the rider can coach one home. Beware. I bet the 10-13 across the board and then box the top 3 numbers in the exacta. 8th: 12-13-10/2-6/5-3-9…The outside is not where you want to be to start a 11/16-mile turf event here, but it is where I will go with my top two choices in this claiming event. Cardinal Coach Mac (12) comes into this one off a near miss second in the last out at this level. Will stretch out a bit more here today, but has the speed to stalk the entire distance. Has a win and a second over the grass so var, and the barn hits with .26% of those making the third start off a layup. Rocktizway (13) has been nominated for the Triple Crow and will be making the first start over the sod today. First two starts were very nice at Zia Park and Delta Downs. Was crushed in a really nice Stakes event at Sunland Park on Jan. 27. Nitrous, who won that one, is a good one. Look for more out of this one today at some nice odds, too. I bet the 12-13 across the board and then box the top 3 numbers in the exacta. 9th: 4/10-8-6/1-12-13/2-5…My second Key Play of the Day comes right here with Aloha Betty (4). This 3YO filly is trained by Buff Bradley, one of the best guys to ever grace a barn area, and he has liked this one’s talent from the get-go. She has speed to burn, and should appreciated the return to the main track today. If she can moderate her speed a bit on the front end and save just a little energy for the late going, you can say good-bye. I bet the 4 to win/place/show and then key the 4 over/under the 10-8-6 in two exactas. I will key the 4 over (only) the 1-12-13 in a smaller version. 10th: 3-7-5/9-4-11/1-2-6…Coexistence (3) has been out 7 times without a win yet, but does have 3 seconds and a third. Ran last two over the main track after moved from the sod. If you go back before, when on the grass, she has been right there in the four times on the grass. Needs a little perserverance at the end of this one to hold on. Sharpin (7) is getting the grass for the first time for a barn that hits with .19% making this surface switch. Comes from a dam that has produced 1 turf winner from 5 starters. Training here on March 18 was lights out. I bet the 3-7 across the board and then box the top 3 in the exacta. 11th: 2-4-12/8-9/6-10…This is a MCL event for the price tag of $12,500, and I will give the edge to Cogan (2). This one has not come close in the first two outings. Not even finished in the same zip code. But the 3YO Distorted Humor colt is dropping all the way from the MSW ranks to this level. The barn hits with .24% of those getting into the claiming ranks for the first time, and with .36% of those routing for the second time. Gets a top rider up. Fire sale here. Anyone taking? Blackard (4) is a first time starter for the barn of Vickie Foley — who hits with .24% of those making the debut. Has worked OK in prep for this one. Dam has a winner from 2 starters and a SW. Could surprise at 8-1 ML odds. I bet the 2-4 across the board and then box the top 3 in one exacta. I will key the 2-4 over/under the 12-8-9-6 in two smaller versions. 12th: 2-7-10/9-3-11-5/1-4-6…I will go with a first time starter in this well-balanced field of many for the 1-mile turf event at the MSW level. Oxburger (2) is a 3YO son of Tapit that cost $900,000 to purchase at the 2017 Keeneland September Yearling Sale. Has trained super here of late for a hot trainer, who has hit with 3-3-0 of the last 9 starters here this meet. Has won with .22% of the 134 starters here this meet. Could be an education experience, but looks to have real talent. The horses to beat, though, are Firewater Jake (7) and Time Flies By (10). The former has run two seconds in a row and looks to be sitting on a super effort. Has the speed to burn and must be patched. Barn hits with .29% of turf starts in the last 1,097 starters. The latter comes in off two seconds in a row and 4 seconds in the last 5 starts. Play to run second? I bet the 2-10 across the board and then box the top 3 numbers in the exacta. 13th: 8/2-3/1-10-11-(13)/6-12…Our Prince (8) is the last Key Play of the Day and the Meet. Has 3 thirds in 6 starts to date, but is dropping out of the MSW ranks to the MCL level today. Gets the meet’s top rider up. My pick. I bet the 8 to win/place/show and then key the 8 over/under the 2-3-1-10-11.